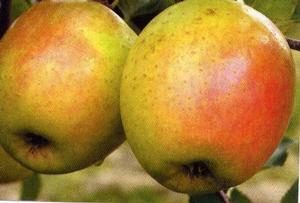 Scab is a disease that can be difficult to control in many apple varieties. Scab has been around forever, and modern growers have to spray to control it. Our great-grandparents accepted some scabby spots on their apples! Growers in the Eastern US, where it is more humid and rainy, have to spray much more often than their Western counterparts. They grow apples in much drier conditions, like central Washington, the largest apple growing area in the world. If you wonder why so much “organic” produce comes from Washington and California, it is because their drier climates are not as conducive to the development of scab and other fungal diseases or to the development of damaging insects, than more humid eastern climates. For commercial growers, apple scab is probably the most troublesome apple fungal disease to fight. Almost all of the apple varieties you find in the produce aisle are varieties that are susceptible to apple scab, and consumers will not tolerate a tiny bit of scab on the fruit that they purchase these days. For the backyard fruit grower who wants to grow apples, one of the biggest obstacles to producing good quality apples is preventing or controlling scab. There are really only two ways— spraying with fungicides (whether or not they are “synthetic” or “organic”) or choosing varieties that are the most scab resistant. Growers have to time their scab fungicide sprays perfectly within hours of an infection and use the proper fungicides depending on whether they are trying to prevent infection (forward action) or cure an infection (back action). Infections can usually be predicted fairly accurately based on complex computer programs measuring temperatures, rain or dew levels, degree days, blossom development, etc. Depending on the spring weather, growers may have to spray many times per season to control primary scab, which typically infects during bloom time and as the fruit is setting, or secondary scab which can occur later in the season during the summer. Severe scab also affects leaves and Grandpa often fields questions from backyard growers who wonder why their apple trees are defoliating and losing their leaves in the summer. You got it— usually scab! Grandpa tries to offer many scab resistant varieties including co-op varieties like RedFree, Jonafree, Williams’ Pride, Enterprise, GoldRush, Pristine™, CimsonCrisp™, and WineCrisp™. All of Grandpa’s Rezista® apple cultivars are scab resistant as are Bella®, Initial, Crimson® Gold, Crimson® Topaz, Querina, and NovaSpy.